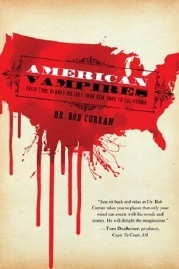 A crimson America dripping blood is the compelling image on the front of Bob Curran's latest book. The cover presents something of a departure from his 'field-guide' series, but the content of the book is actually quite in keeping with the rest of his growing compendium of works detailing the origin of monstrous entities from fable and fiction. In this case, 'American Vampires' picks up on the current popular trend in Vampiric fiction, exemplified by the Twilight series of movies. Dr Curran explores the myths and legends of vampires of all shapes and series across the USA. Given the cultural melting pot that country represents, both in terms of its indigenous roots and the various communities of settlers from Europe and beyond, the various concepts of vampires are varied to say the least. Indeed, many of these tales seem to represent composite vampires. From the European side, German immigrants brought with them many vampire creature myths familiar to our modern perspective. Further influences came from the African continent. Curran does a great job of demonstrating how the various American vampire myths grew from the particular immigrant groups settling in the different states, and how they melded with the local Indian stories. But the 'vampires' themselves are a broad church indeed. Some of these varieties, it must be argued, lend themselves more to witchcraft than the undead, or sometimes even resemble The Little Shop of Horrors more than Twilight. Whether tall tales of vampires dug up by superstitious locals is to be believed is indeed a moot point, and Dr Curran does a good job at presenting the evidence in an impartial way. Because as strange as it may seem, odd discoveries about bizarre new human species do surface, as the discovery of homo floresiensis showed. Whether a similar pygmy species of human, this time with a penchant for human blood, dwells under the mountains of Wyoming is very much open to the kind of speculation Curran loves to indulge in. Similarly, the fabled chupacabra has certain vampiric qualities, and the author explores this connection when reviewing the south-west USA. Once Puerto Rico is properly established as the 51st State, then I can see this book expanding further. More evidence of exsanguinating monsters takes the form of cattle mutilations, which apparently goes back as far as the 16th century. In those days, mysterious deaths were attributed to 'skinwalkers', a subject Curran explores in some depth. More modern occurances have taken on a Ufological dimension, indicating how these strange events present a different perspective over time. More prosaic explanations for popular accounts of vampires preceding the modern medical era centre around TB epidemics which spread through families and communities. The author gives detailed accounts of the sad stories of Rachel Burton and members of the Tillinghurst family who succumbed to "consumption" and were thought to have returned from the dead to torment the living in the form of a vampire. One can understand why such ideas circulated as TB slowly destroyed families one by one. As a result, the bodies of TB victims were sometimes exhumed and purged of the vampire curse in various ways - a practice we consider abhorrent. But in those days, the fear of vampires could be very real, and the stakes (if you mind the pun) very high indeed. In the case of the Rhode Island "vampire ladies' such superstitions existed almost into the 20th century. Which brings us back to the gothic romanticism of the modern day. Does anyone take the possibility of real vampires seriously in the 21st century? Perhaps not, but this book provides a wonderful selection of associated stories from America. Taken together, they offer a very unusual and alternative chronicle of American vampires. Subtitled: "Their True Bloody History from New York to California"